mixed media of all sorts challenge. If you haven't already taken a look at team A's projects I highly recommend you do so. I will give you the link to the post at the bottom of this post. Please, make sure you read our few challenge rules if you haven't already done so or are new to our challenge blog. It would be a shame if you entered a project to our challenge that cannot be considered with the Top5 votes or prize draws for some reason. 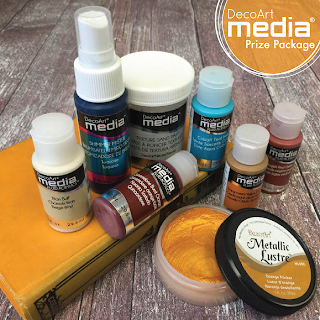 Our two generous prize sponsors DecoArt Media and boozybear are again giving away a prize bundle each to randomly drawn players - so make sure you do not miss the chance to get some cool paints and media or fab steampunk chippies! And here come the projects of team B! Please, take some secs to drop them a short line on their blogs so they know their efforts have been recognized! You will also find more information on how the projects were made on the teamies' blogs - so it is well worth a visit! You get to their blogs by clicking on their names. Thank you. 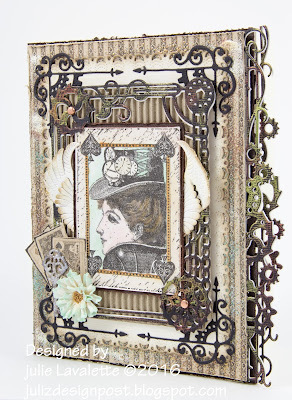 And, please, welcome lovely Maura back to our little creative steampunk group! We are all so happy to have her and her magical and storytelling art back with us! I am honored to be back with you again! My imagination ran away with me and my three adventurers are riding the time waves! I used DecoArt acrylic paints to create the waves background, all finger-painted- felt like a kid again! So how do time riders get to the waves? 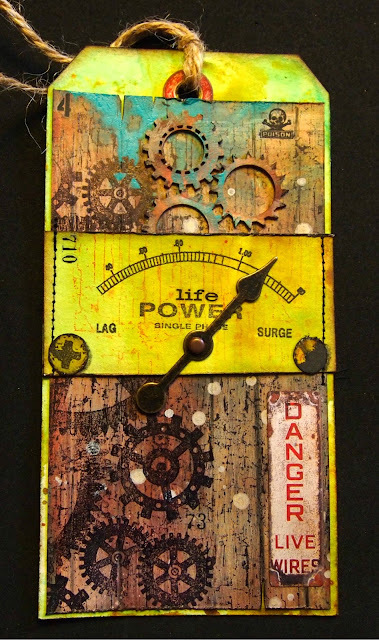 On an air rocket of course - chipboard from Boozybear! a lot of chippies and the most important tool ever ? My first attempt at a Coptic stitch book. 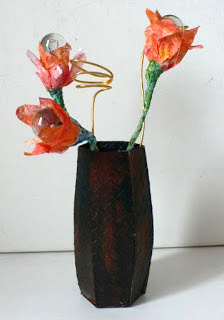 I used some leather paper (awesome stuff! ), distress inks, some embossing and alcohol inks. 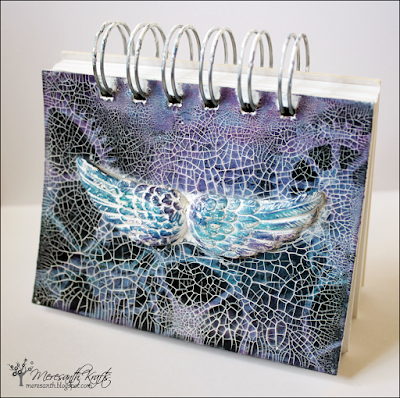 This book holds special meaning and was conceptualized in a special way. Yay! I will never run out of good ideas again - now that I have my "Geistesblitzgenerator" (which is German and means "flash of genius - generator")! I used parts from three different packs of Glenda -aka boozybear's wonderful steampunk chipboard pieces and loads of DecoArt Media to create my little "helper". And here is the promised link to the post showing team A's projects - just click HERE. The Top5 and prize winners from the May challenge will be announced on Saturday, 11th June. So make sure you come back to find out if you are among them! Servus and welcome to today's announcement of our lucky prize winners and Top 5 artists! 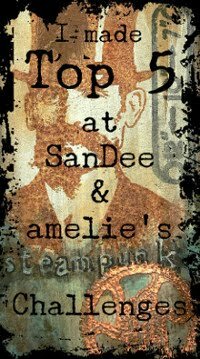 And once again I want to thank all our fabulous and true players for making this place what it is - a spot filled with highly inspirational steampunk and industrial mixed media art!!!! We wouldn't be where we are now without you and we hope that you all enjoy this as much as the team and I do! We have a new rule though that I would like you to take notice of: from now on we ask you to claim your prizes within four weeks after the announcement. I need to ask this of our prize winners to keep prize advising managable for me and our generous sponsors and I am sure you all understand. this great DecoArt Media "Steampunk Starter Kit"
and all you have to do to win one of these is play along and enter a project to our actual challenge. It's that fun and easy! who wins some fab boozybear chipboard pieces to craft away! 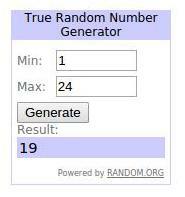 Congrats on your prize wins, ladies! 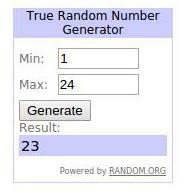 And thank you for playing along! Have fun with your new goodies! Please, contact me via email so I can forward your shipping info to our sponsors! 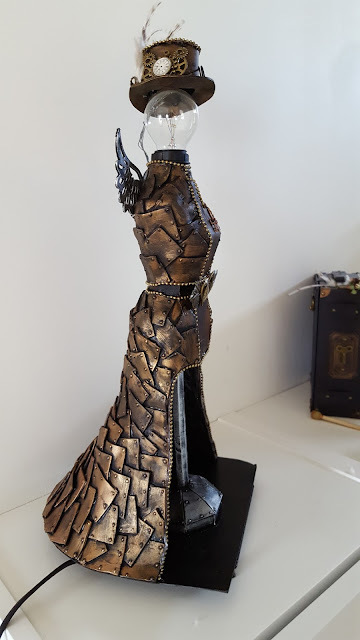 And, please, can the DecoArt prize winner also include her phone number with the shipping address when contacting me via email to claim her prize! 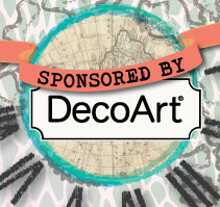 DecoArt only ship when they have one's phone number. Our actual challenge (again an "Anything Goes - Steampunk/Industrial" one) has already started. If you want to check out the makes of team A, click HERE. Also make sure you stop by on May 15th to take a look at the projects of team B! New Challenge, new (old) DT Member! 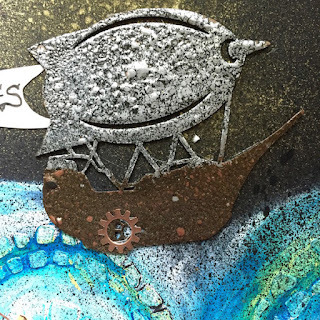 Servus and welcome to our little mixed media steampunk corner! We are not only happy to see you stop by but also to share the wonderful news with you that lovely Maura from Two Crafting Sisters is back on the design team! Welcome back, Maura! It's so good to have you with us again! 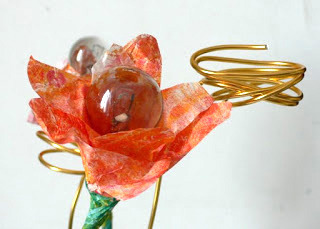 Maura will post her first DT project as a member of team B who show their projects on the 15th of each month. So make sure you come back then to check it all out! will be announced on Saturday, 7th May! A huge thank you to all who played along and entered those fantastic projects - we were as always gobsmacked by your imagination and creativity! And of course we will give similar prize packages to two randomly drawn players from the new May challenge - so make sure you play along to get a chance to win one of these! 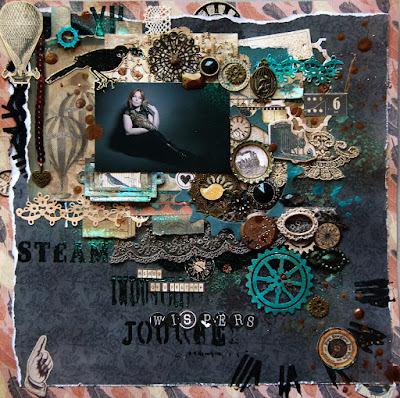 Team A has prepared another bundle of steampunk/industrial mixed media inspiration for you! So let's take a look , shall we? And if you take a sec to visit their blogs you will learn more about the projects. And if you also leave a short comment there, that would be great and more than highly appreciated! To get to the teamies' blogs, simply click on the names. Hi! This time I made scrapbook layout with birds. My friend made me photo session with two birds. 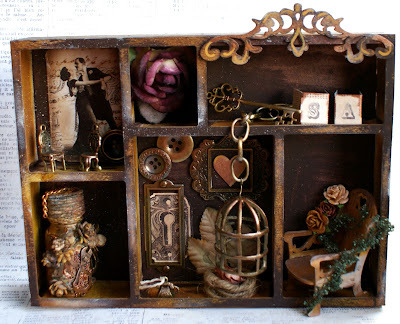 I used one of them for my steampunk- spring work for you. Hope you enjoy! plus de détails a découvrir sur mon blog , merci à vous pour vos visites . The challenge will be open until the end of the month. Make sure you check out our few challenge rules - especially our update on claiming your prizes - if you are new to our challenge blog or if you haven't done so far. It would be a shame if we had to exclude you and your projects from our Top votes or prize draws (I am sure you all understand that we want and have to be fair towards those who take the time to not only read them but also care and follow).